Thank you for the recent letter to NFL fans. I’m pleased to see that the League is paying attention to certain concerns. I feel that the manner in which you addressed these issues in your letter shows much promise and wish you the very best in implementing some positive changes. I especially appreciate your request for feedback as referenced above and feel I would be remiss if I neglected to respond. While I applaud the efforts for positive change the NFL has made in several areas, I think we can all agree there are many areas in which improvement is still needed; foremost among these; transparency from the league. I realize this is a huge request, but strongly believe it is the largest single area in which fans are in agreement and united in desire for change. You’ve helped to build a megalithic empire in the National Football League, and with that achievement comes a double-edged sword. Not only are the games and players in the public spotlight and scrutiny, but the Management Council as well; therefore your actions and those of others who occupy this lofty position are of public interest and concern. Last season in reference to domestic violence investigations you said that that the matter is “complex,” and implied it was beyond the comprehension of the NFL fan base. While any reasonable person would agree on the complexity, I beg to differ on the latter point. The NFL fan base is vast and broad. It is composed of people of all ages from young children to octogenarians and beyond; people of all incomes and levels of education; people of diverse political views, people of varied races and ethnicities, people of both genders people composing the spectrum of sexual orientation; as such you are correct in stating that not everyone will “get it.” But please don’t insult the intelligence of the many people who can and do understand the complexities involved of this and other challenges facing the league. While any particular decision or policy will come with some degree of disapproval, the majority of people in all the diverse groups which compose the NFL fan base value honesty, truthfulness and transparency, and much will be forgiven if these qualities are exemplified and embraced by the league, and especially by you, as its foremost representative. Please indulge me as I dive into a few areas in which the public would like to see improvement. As you read, please keep in mind that a friend will compliment you when appropriate and call you out when he or she feels it’s merited and in your best interest. In this regard I ask you to consider these remarks and suggestions as coming from a friend of professional football. This seems to be a logical starting point since your aforementioned remarks were made in this regard. Domestic violence and sexual assault are societal problems with current statistics showing that as many as one in four women are victims of domestic violence, accounting for 20% of all violent crime in the United States. Sexual assault is estimated to affect one out of every five or six American women. With a problem this widespread, it is only logical that it will exist to some degree within the NFL, as players are a part of society. The fact that it isn’t more widespread within the league should be recognized along with the fact that athletes are no more inclined toward abuse than the population at large; but inevitably it’s going to occur from time to time. How it’s handled and not the fact that it has taken place will form fan opinions of the league. Two essential factors come into play here: (1) The victim or alleged victim’s needs must ALWAYS come first. (2) The abuser or alleged perpetrator of the misconduct has a problem and as such his needs must be addressed through a combination of assessment, counseling and accountability, which includes appropriate discipline. Thus far the NFL has been reactive and evasive in this regard. Apparently in reaction to extensive media coverage coupled with an angry public, you crafted a one-size-fits all suspension rule for a problem that is far from one-size-fits all, then failed to abide by your own rule when you no doubt discovered it was problematic. Instead you’ve relied on the “mitigating” or “extenuating” circumstances clause for relief without any degree of transparency in regard to what comprised these circumstances. What I’d recommend is a pro-active and straightforward response next time allegations of this nature surface. How about considering a press release something along these lines at the very onset of a situation? Then, after the release, as the investigation unfolds, do exactly as you’ve stated you’d do with honest and transparent periodic updates. This is not a time to show political favoritism within the league, based on either relationships with owners or a player’s level of talent. People can see easily see through this. One of the largest criticisms hurled at the NFL is that of hypocrisy. If you address issues such this fairly, honestly and head on, you’ll go a long way in dispelling this perception. Once a decision has been made and a discipline levied, you will no doubt face some criticism. Use that as an opportunity to educate and let people know the factors that were used in reaching your decision. No company lines or clichés here – real talk about real issues that unfortunately aren’t always clear cut. You’ll find in the long run that while you’ll never find everyone in agreement you’ll at least earn respect of the majority when you’re forthcoming and present the matter openly and honestly with sincerity, and you do this consistently. You’ve made some positive strides here, but, because of the lengths the NFL has gone to in the past to deny the risks of brain injury to players; only acknowledging the dangers after congressional hearings, a movie, broad media coverage, and some very public lawsuits demanded a response, fans are skeptical. By and large many of the NFL’s current efforts correctly or not, at least appear forced and shallow. No one enjoys reading about another former gridiron hero who has been diagnosed with dementia, ALS, or another degenerative condition commonly associated with brain trauma. Who will be the next player to die prematurely or commit suicide because he could no longer deal with the inner torment? Fans are watching the game differently than they used to. We’re aware of dangerous hits, and contemplate how they will affect the men who are now playing the game. We applaud rules which increase safety and hope that the league will continue in this positive direction. But please excuse us if we are tentative regarding the motivation for these changes. Have they been implemented merely to decrease legal liability or out of concern for the players? My guess would be a combination of both factors with the former probably the weightiest rationale within certain circles. People are skeptical because of past evasion and lies. Regarding research on brain injury you are to be commended for providing funds for research – however – you must be content to pledge these resources to independent, neutral scientists who have no stake in the outcome of their findings. Let them move through their research following a path of sound scientific protocols. Whatever the findings might be, allow the peer-review process to move forward uninterrupted and then work with the scientific and medical communities to find lasting solutions. This is an area in which uncomfortable and painful truths must be acknowledged and honestly dealt with in order to preserve not only the health of the players but the future of the game itself. To do otherwise seriously undermines public confidence in the integrity of the game of football and to regress in this regard could very well be football’s existential threat. Prescription painkillers are addictive. Painkiller addiction is reaching epidemic proportions in society and no single group of people is more at risk than professional football players. Better measures than a Toradol waiver that forces a man to choose between his health and career must be taken by the league in regard to the NFL’s pain management problem. Deposition testimony and discovery documents that have surfaced in the ongoing lawsuit by a group of former players against the Clubs of the NFL paint a damaging picture of denial, carelessness, and an over-all prioritization of profits over player health. The NFL’s latest statement on the allegations, said the players’ claims were without merit. While I’m quite aware this is a legal tactic, and the legal teams utilized by the NFL and its member clubs are among the best at their jobs, it’s time to stop playing games. Think about your predecessor, Paul Tagliabue, and his remarks about concussions. Those words are now coming back to haunt him; don’t follow in his footsteps in regard to the painkiller problem. Own it. Address it. And work for solutions. There aren’t any easy answers or solutions here, but this is where leverage and agendas need to be put aside. Talk to the players and work with, not against the NFLPA. Explore how marijuana, at least the CBD compound might provide a safer pain relief alternative. Consider the suggestions of the Harvard study which concluded that club physicians face a conflict of interest in serving the team and getting the athlete back in play versus looking out for the player’s long and short-term physical well being. Other areas to look at include increased roster sizes and better compensation of injured players. We all know the typical NFL career is short; even long careers are measurably shorter than more traditional employment. Young men are forced to choose between the career they’ve dreamed of and the short time frame they have in which to make the bulk of their income balanced against very real risks to their health and future well-being. Instead of investing in litigation costs, why not invest in the men who play the game? The men who represent the game in the eyes of the public? You say that football is family. Prove it, even if it’s somewhat costly. You say you support the military which has a motto of “no man left behind.” Make this your goal as well. The things I’ve asked of you might lead you to believe that I’m opposed to profit. That couldn’t be further from the truth. Any reasonable person understands that profit is good and necessary and a goal of every business. Harm results, however, when profit is prioritized above all else. I realize that you’re not the sole decision maker in the league and that you have thirty-two bosses who expect a handsome return on their investments. I hope you’ll share this letter with them. While I’m certainly not of your status financially, as a former business owner I can relate from a business perspective. Please hear me out on this line of thinking, which I wish to share from personal experience. When I started my business, a ballroom dance studio, I had a lot of background, as I’d worked in that sector for a number of years, and I was privy to a variety of unsavory practices within that industry. When I decided to open my studio I didn’t have a lot of back-up funds and needed to turn a profit and do so from the onset. I also wanted to be a reformer. Ultimately I decided the latter was my most important goal, and kept faith that my product was good enough to secure the former. I eliminated all of the hard-sell practices I’d been indoctrinated with, and the prevalent commission structure based on large and deceptive dance package sales. Instead I offered my staff the highest hourly wages in Atlanta ballroom dancing, health insurance for full-time teachers (unheard of in that business at the time), and paid vacations. A lot of people thought this unorthodox approach was crazy, at least in the beginning until they saw it working. My simplistic approach of “a happy staff produces happy customers” worked. I attracted the best talent in the area because I prioritized and cared for my employees as my most valuable asset. My customers were happy because business was conducted transparently, with the goal of giving them the best possible value for their money. The needs of the people involved, both employees and customers were always at the forefront of my decisions. The studio thrived and was impetus to a number of changes in the way Atlanta dance studios did business until I sold it and moved on due to injuries I sustained as a dancer. Some have asked if I’d have made more money if I approached business in the traditional way. It’s hard to say. What I will say is that I lived comfortably, and slept well because I felt I was making an ethical difference. That’s worth a lot. What drives the need for ever increasing profits, often at the cost of appearing greedy to the public and unconcerned about players and fans to any real degree? I ask this seriously. It stands to reason that at any income level one would have a certain lifestyle to support. Certainly nothing wrong with that. The question becomes how much is needed to sustain one’s lifestyle and how much is excess? That’s an important consideration. When one achieves business security, and the lifestyle one desires, where is the line drawn between enough and excess? What is the price others pay for the excess, or what good could be accomplished by re-focusing or reallocating such funds? I ask you and others in the Management Council to give this some thought. There are other concerns which I’d like to address such as neutral arbitration of player discipline, relocation questions and support for player expression and individuality, but I feel I’ve already given you much to consider and digest. The first step toward implementing positive change is, as I said before, transparent, honest, and diligent effort – probably the type of effort you exerted when you first joined the League as a young intern. Rediscover that. We must be willing to address the institutions we love in a critical manner in order to see them grow and thrive to their fullest potential. 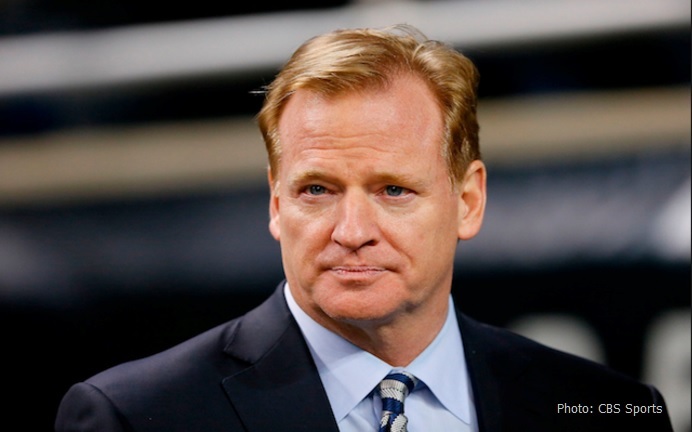 As commissioner of the National Football League you have a legacy Mr. Goodell. It is up to you to write that legacy. You have been elected as a leader. Lead. Please, no more business as usual. Break out and be a trailblazing reformer. Let history remember you as the man who saved football; not the man who buried it. I welcome a response from or dialog with you and will publish unedited any communication you might wish to share.